The likelihood that scientists draw blood from prehistoric mosquitoes, use it to populate a park full of dinosaurs and charge you admission to hunt said dinos down, seems pretty small. 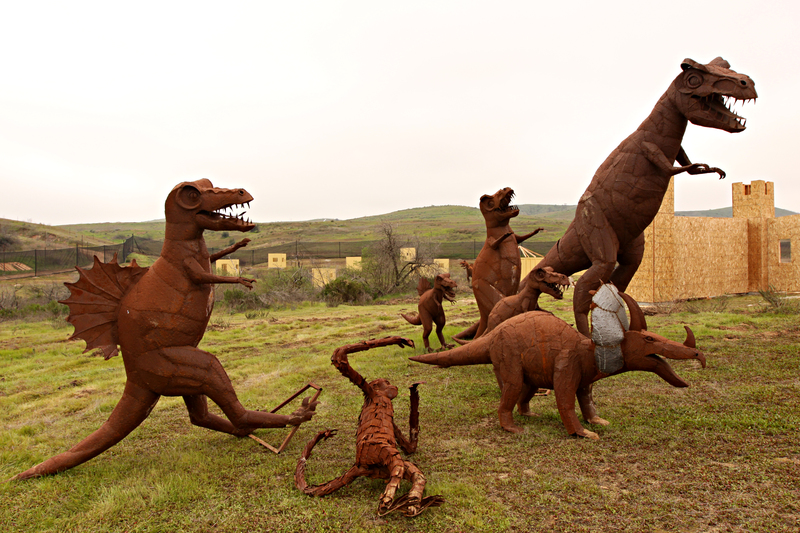 But some capitalists at Camp Pendleton, Calif.’s Paintball Park know you’d still love to take a potshot or two at a T-Rex. With that in mind, dinosaur sculptures are being incorporated into a $2 million upgrade at the park, under construction at the site of the old rodeo grounds on Mainside. The park is still under construction, but it has begun operations. As of Jan. 22, the park is operating 8:30 a.m. to 4 p.m., Friday through Sunday, according to a Marine Corps news release. It is also open Monday through Thursday, but by reservation only. Cost is $35 for a day pass for members of the military and their families. Civilians pay $50. For more information check out the Marine news release here. You interested in blasting these dinos with paint? 2 million dollars and I cannot get toner cartridges and pens…way to beat the budget defecit. Hi, Rick. I should have added that the Paintball Park is not operated by the Marine Corps, but a private company — Invent Management Solutions.